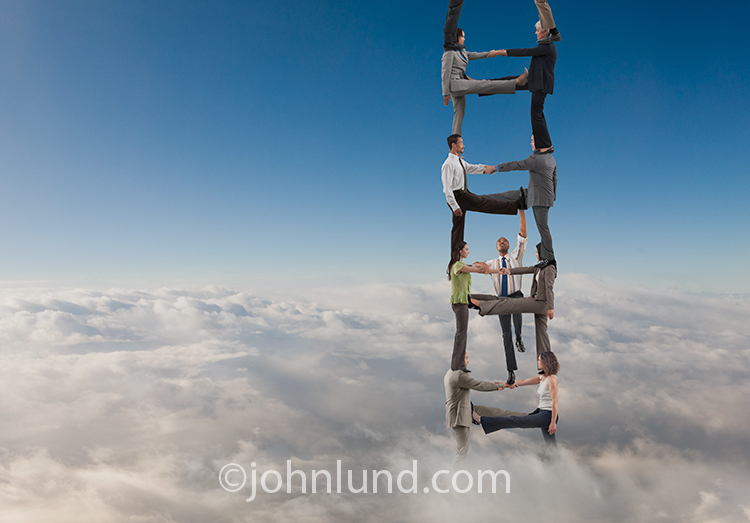 An old idea with a new twist, a businessman climbing a ladder created from people standing on each other's shoulders is an example of a stock photo strategy that has paid off for me. While there doesn’t seem to be any sure fire way to guarantee that a stock photo idea is going to result in a successful (financially) image, a strategy that has generally worked well for me is to start with an iconic symbol and add a new twist. If you can add into the mix just enough ambiguity to provide for more than one concept, then the odds of an image generating a good profit increase dramatically. Take for example the classic, iconic symbol of a businessman climbing a ladder. What could be more common, hackneyed and even, at this point, boring? Yet such an image has the advantage of being a quick read, something that is burned into our subconscious and can be powerfully compelling when presented in a new and different way. It was with this idea in mind that I decided to create an image with a significant twist, a ladder created from people standing on each other’s shoulders and using their arms and legs as rungs. A cool thing about such an image is that the concept broadens from the classic “climbing the ladder of success” and “challenge” to include “teamwork” as well. By adding a background of high altitude clouds we can even bring in the concept of “the sky is the limit” and “possibilities”. Adding the high-altitude cloudscape in the background helps raise the potential of this concept image by providing a background that most of us seldom see unless we happen to be seated at the window of an airliner at a very opportune moment. This cloudscape background image is actually the combination of several different captures combined in Photoshop. Any time we see something that we don’t see very often it tends to be more compelling. The models who are creating the ladder were each photographed separately for a different project…a human DNA chain, which by the way has not sold despite being online for over a year now…oh well. So, to put this image together we have something like a dozen photo shoots of models (albeit for different images), shooting out the window of a jet (headed back to the Bay Area from a shoot in Mexico), and probably two days of Photoshop work between putting a cloud image together as well as compositing the human ladder and so forth. Ultimately the question for me, as a professional stock photographer, is whether such images are worth the time, effort and resources that go into them. It really comes down to whether the image will pay me back sufficiently for my time and effort. While some images, such as the DNA image, clearly don’t work, many others do. I expect that this image will bring in at least $5,000 or more over the next five years, and if it does I will consider it successful. If it brings in a return significantly below that amount then my strategy will have failed me. While it is impossible to know what the future will bring, to this point creating images like this human ladder have served me well. I think its a great shot and a brilliant concept. Not suitable for micro but for RM. May I ask why you set exactly 5K over a period of 5 years? 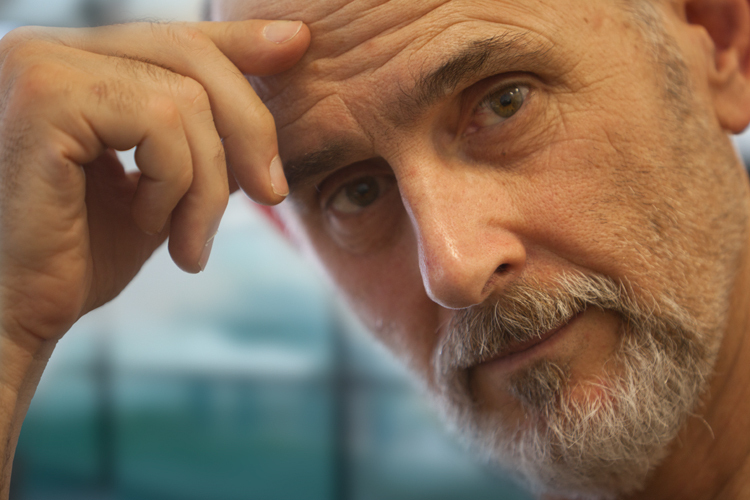 As always, great to read your insights on what it takes to make a great selling, (RM?) image. Sounds in keeping with our photo 'stats'. BTW thanks for keeping this Blog going. Yeah, RM. Thanks for the encouragement on the blog...it is easy to forget that people enjoy it! John, I absolutely enjoy reading your blog and always look forward to the next posting. Thanks!